It is hard to believe one single movie can include two of the most charming human beings on this planet. ‘s The Tourist (2010) did it by presenting Angelina Jolie and Johnny Depp together. But beautiful faces are not equivalent to a good movie. Angelina Jolie and Johnny Depp are arguably the two most successful Hollywood movie stars. Separately, each of their name can almost guarantee enough eyeballs. Not to mention that this time they are put together in the same movie. Once again, Jolie’s dangerous beauty is fully showed by her character set as an woman agent, which makes people easily remember her performance in Tomb Raider and Salt. Her stunning beauty is woven with elegance, which is reflected by luxury hotels, shining jewelleries and most importantly, her smile, combining mystery and contempt. Johnny Depp, who plays as an American tourist (Frank Tupelo) to Venice in this movie, finally shows his elegant side. But his wickedness can still remind you of the famous Captain Jack Sparrow. Both of the two stars maintain their performing legacy from their previous movies. Audiences who are familiar with their previous characters can have a certain degree of control, as the two stars do not go very far from images that make them famous. The story mainly takes place in Venice, although Paris and London are also mentioned by clearly are put at less important positions. The story almost turns into a publicity material when Elise Clifton-Ward (Jolie) arrives in Venice. A lot of panoramas are used to predict the view of Venice. Together with romantic music, the luxury hotel (Hotel Danieli) is displayed as a must-go place for lovers (with enough money). Publicity scenes are so obvious that they may even lift audiences up from the tension in the movie. Jolie almost becomes a tour guide in Venice as the camera follows her throughout the city and she talks some nonsense that is not even helpful to push the plot. Scenes depicting the romantic complex between Elisa (Jolie) and Frank (Depp) has literally made me sleepy even on the not-so-comfortable seat in the cinema. Thanks to the two stars, Florian Henckel von Donnersmarck, the director, may enjoy a different type of success. This one may be a hit for box office, but may never reach as high as the Oscar winning The Lives of Others (2006). It is a must-see movie for fans of Jolie and Depp or both of them, but it is a disappointing movie for those who expect more on the director and on the story. The coin is spinning. Randomly some patterns of the two sides show within a blink of eyes, but they cannot be clearly seen. Speaking of student demonstrations, images of France in 1968 and Beijing in 1989 frequently come up, although they are more likely to be mentioned as riots, for violence is the keyword. 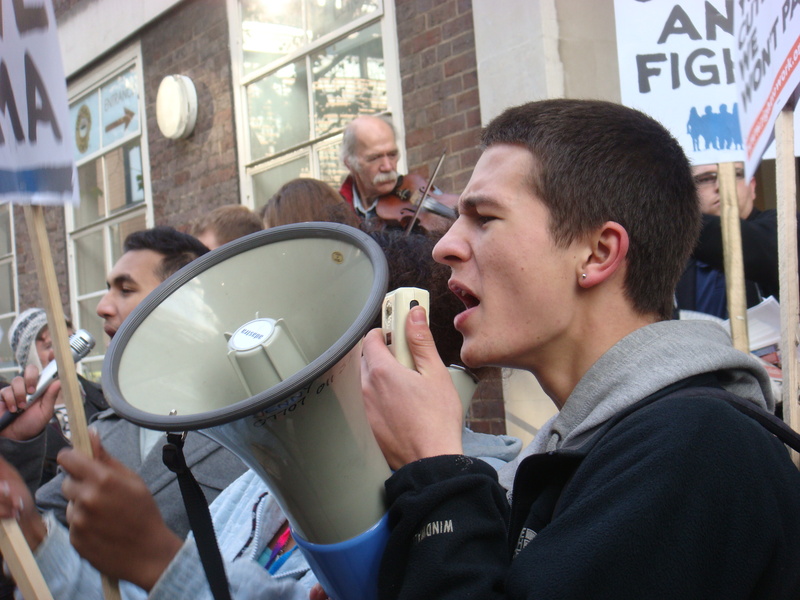 The demonstration in London on 24 November shares with previous student movements those violent factors. But like a spinning coin, what makes it bear a mixed impression is the other looming yet recognisable side – the carnivalesque atmosphere. Posters can be found at many places around University of London Union (ULU), the starting point of the demonstration. Colourful masks and a clown, which are also on posters, suggest that the demonstration is supposed to be cheerful. The demonstration follows the prototype described on the posters, as students start to gather with excitement and joy on their faces. They greet and talk to each other with smiles even if they have never seen each other before. The same event puts them together as friends. The atmosphere is heated up by pop music and strong drumbeats. Students are nodding heads and waving their hands according to the rhythm. Apparently they have not forgotten the resistance part of the carnival. As they gather, they start to show their anger by shouting slogans. “No ifs, no buts, no education cuts!” They shout, briefly in words and loudly in voice. The pattern of violence looms, yet the spinning coin quickly blurs it by bringing some string music. 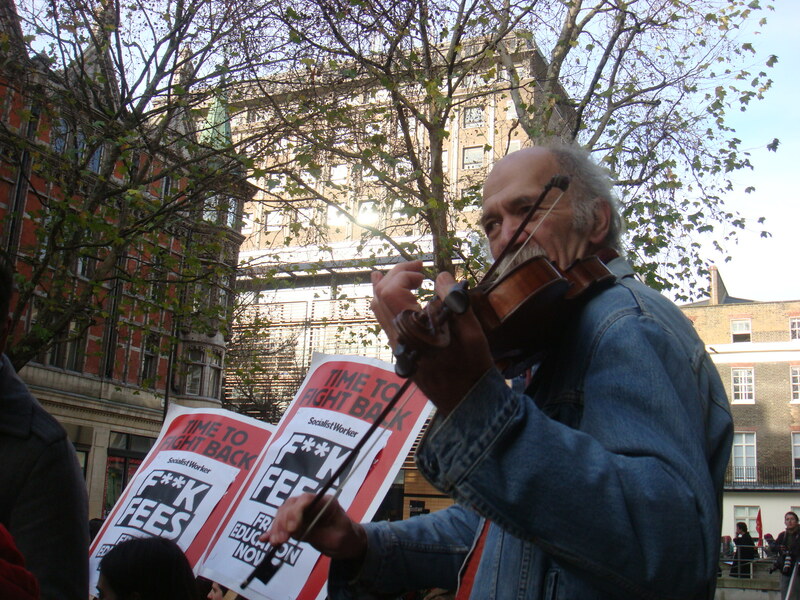 An old man stands besides the crowd, playing the violin and tapping his foot with the rhythm. Ed Emery, who is 65 years old, is now in his first year of PhD at the School of Oriental and African Studies. The sound generated by students sometimes overwhelms that of Ed’s strings, but the old man seems far from being upset about that fact. “I support the students. I want to help them to prevent the government from destroying the university.” Ed is blunt about his stance on the education cuts issue, reminding people of the fact that he himself is a student as well. If the story ends here, this glance of the demonstration seems to be a nice party where everyone enjoys their indulgence factors. As the spinning coin slows down, both sides of it can be seen more clearly. The march to Trafalgar Square is still surrounded by a carnivalesque atmosphere. How often can you see Edward Scissorhands on the street? The curly and a bit messy hair, the pale face, the scarlet lips, the neat shirt, and of course the scissorhands, are always ready to arouse some screams. 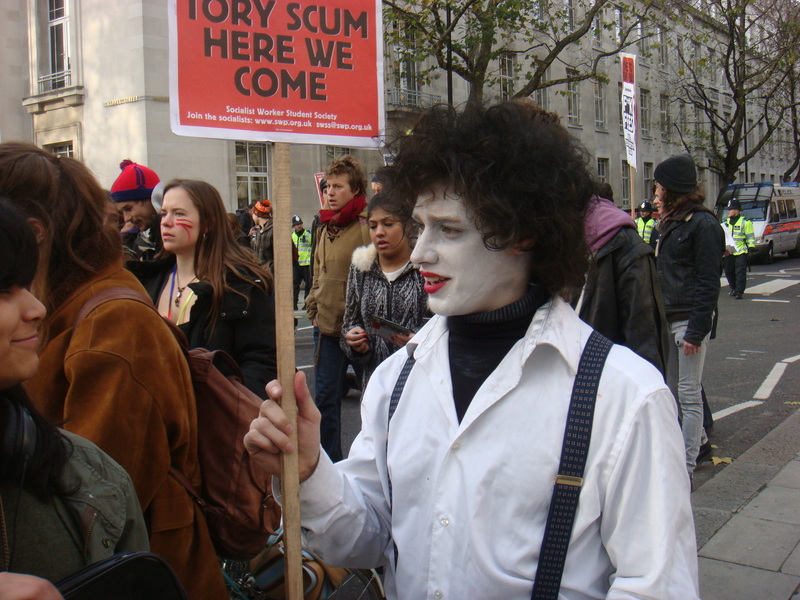 People who follow protesters have the chance to meet the famous character from Tim Burton’s movie, on the street. The switch then comes as the carnivalesque exterior starts to fade away when students are blocked by the police in Whitehall. Tension rises quickly at the confronting line, as the police intend to halt the wave while students want to break through. 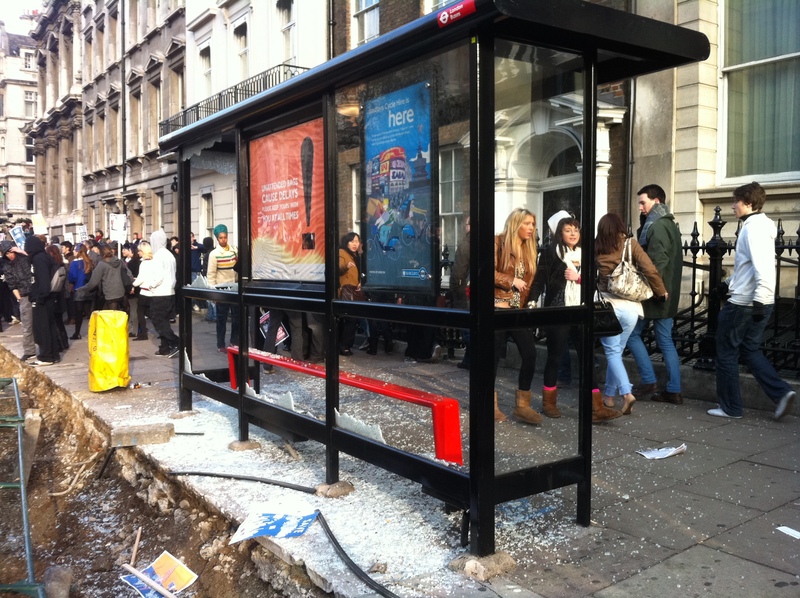 The unstable balance is not broken until the trigger comes, when some students smash the glass of a bus shelter. 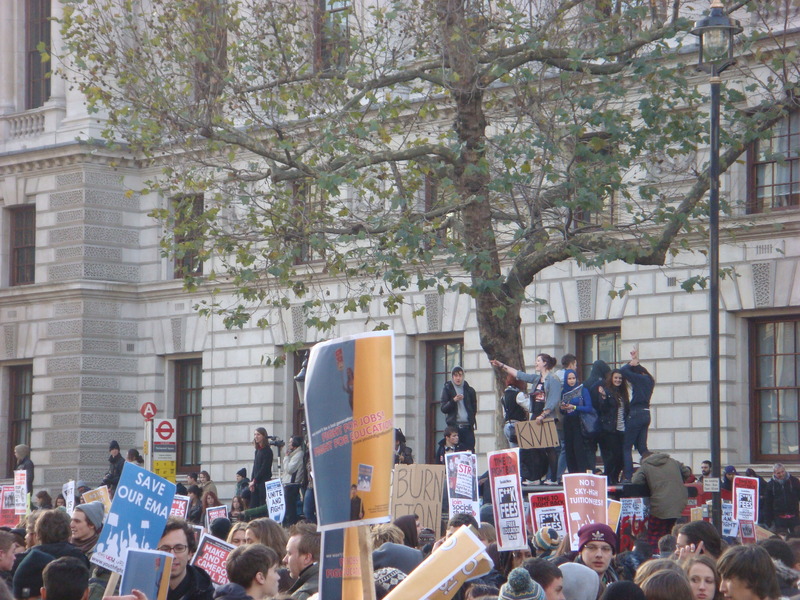 The image of the demonstration is blurred again, with anarchy rising and helicopters roaring, together with music still playing and students dancing. The coin is still spinning. Even though it has slowed down and patterns of both sides are better shown, it is still spinning. Carnival or violence? It is hard to tell the true face of the demonstration. Both faces are merged together. Both of the sides can be clearly seen only when the spinning stops, but will it? *The previous version was posted on 25 November. Thanks to my course at the University of Westminster, I had my first touch on a real newsroom of a British media, as we paid a visit to the Telegraph. A few days after that visit I was still a little disappointed as I had expected more than that. But as a first visit to a real newsroom, that trip still remains very eye-opening and to some degree, exciting. First impression is crucially important as it tends to remain in one’s mind for a long time. The “Newspaper of the Year” of the UK has a very humble appearance from outside. Stepping out of the Victoria Station , you can even miss its building if you do not know the exact address – 111 Buckingham Palace Street. Unlike the BBC, The Telegraph has no such a logo hanging outside the building. If you are not expecting for a newspaper quarter, you may find it like a random front door of a hotel – a not very expensive one. The security is impressive. Visitors will be checked name by name and previous registration seems necessary. A random visitor is not likely to get in. 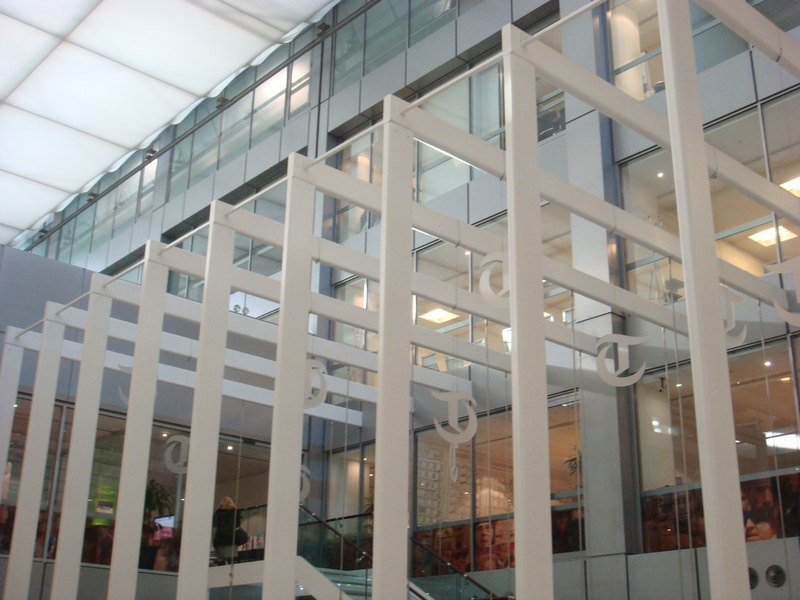 The lobby resembles a shopping mall in every aspect – warm lighting, cosy sofas, a high ceiling and huge glass windows. We can finally spot logos of the Telegraph – the specially designed “T”. Again, if you want to enter the heart part of the newspaper, you need to pass another security check. The most impressive decoration in the lobby is a decorating pattern made up by a lot of faces, which belong to those world’s most recognisable images, including former French President Jacques Chirac, Venezuela President Hugo Chavez and the American movie star Tom Hanks. The company culture is a quite complicated conception while it can also be really simple. 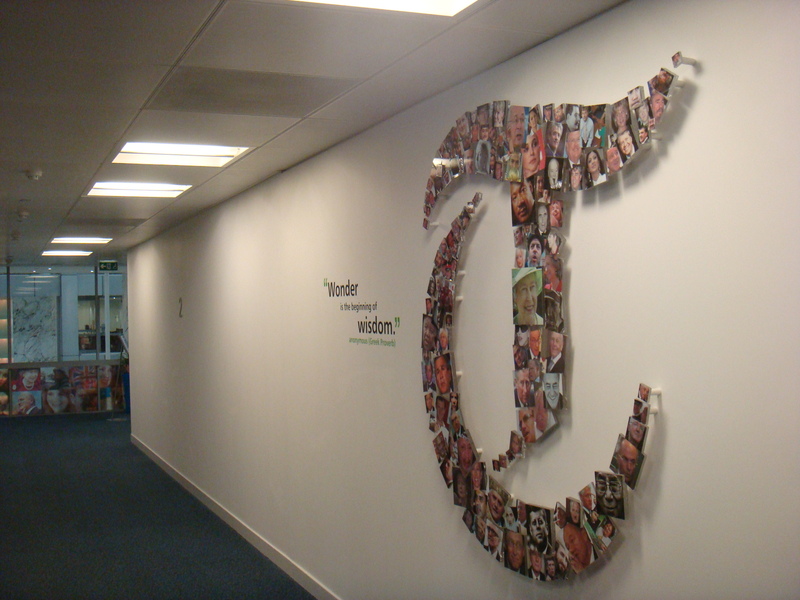 As a news organisation the inner decoration of Telegraph is no different from other modern companies. 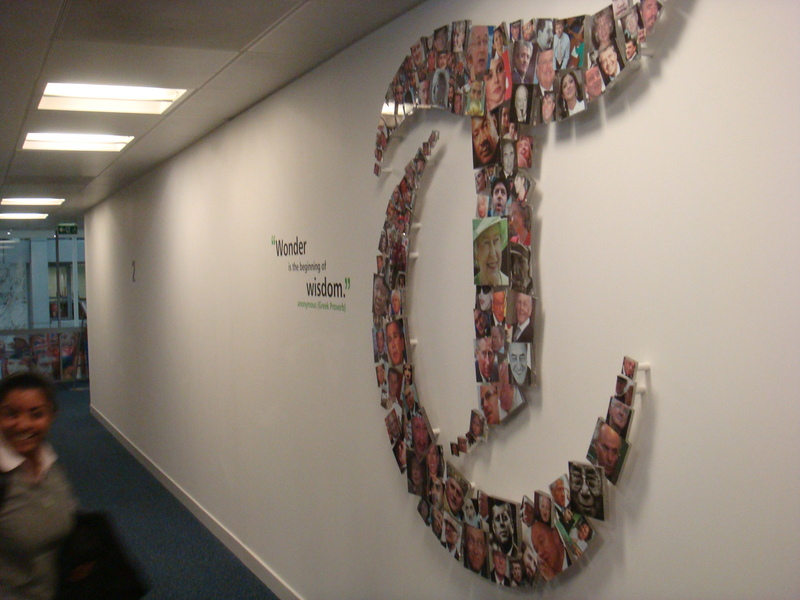 It has simple but comfortable design style, with its company culture being reflected on the wall – mottoes related to journalism in several languages. Sadly as I Chinese people I did not find a motto in Chinese. The Telegraph is quite generous as a media. Not only they let all over 40of us in, but also that day’s paper and tea and biscuits were provided free. It could be explained as “it is a big media oranisation whose generosity is obviously assumed”. Still, it makes people comfortable. We listened to a lecture by their Compliance Officer – a lecture which is a little too long and exhausting but interesting enough. As a media group, they are very cautious. Any unnecessary problems were to be avoided. We were asked not to name the lecturer in our blog and anything that could be controversial was required to be excluded. The most exciting part of this trip was walking through the newsroom of the Telegraph. 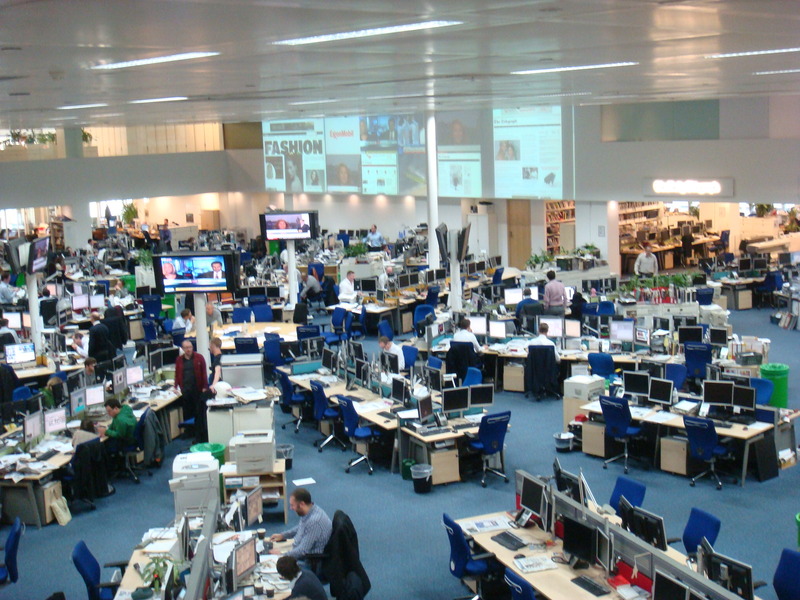 For a newbie in journalism who rarely go into a newsroom, the panorama of the Telegraph newsroom was amazing. You just cannot help clicking with your camera. Visitors are firstly only allowed to take pictures on a higher floor through a glass, which makes me feel in a zoo. I really wonder how those professionals down there can bear such a feeling of being watched. Maybe they have just got used to it as part of their job. The time we went there was in the morning, hence it was not the most intense time for a newsroom. At least half of the seats in the main hall were empty. Then we went down to the newsroom. I could not help holding my breath when getting closer to people who were working there. The feeling was rather mixed. On the one hand you wanted to get as close as you can to the working atmosphere, on the other hand you realised that you were still an outsider and you should keep some distance. 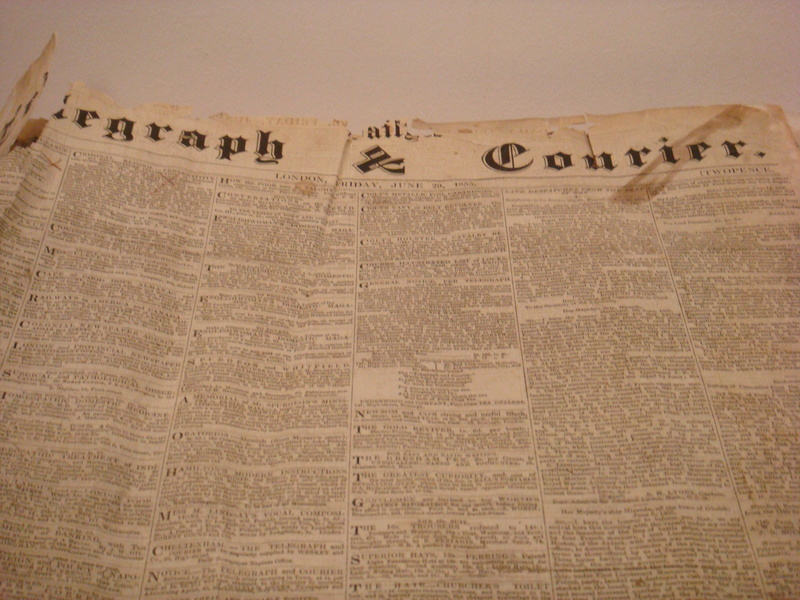 The surprise came when we see the very first version of The Telegraph. You could tell the age just by the paper which had turned yellow. A newsroom that respects its history and legacy will benefit from the time it passes. It is not carnival. This was the impression in my mind when I came back from the student protest on education cuts. Although it is supposed to be one, with violin. Yet it did look like a carnival when everything was still peaceful and quite well organised. It could have been a regular demonstration, without violence. The students demonstration in London yesterday turned to be violent in the end despite the carnival atmosphere engendered at its early stage. When I spotted Ed yesterday, he was playing his violin, smiling and stepping the ground by the pace of his tone. It was outside the Birkbeck College on the Malet Street. It was also the place where students involved in the protest were supposed to gather. Soon there were a lot of students warming up themselves for the demonstration, by shouting their slogans. “No ifs, no buts, no education cuts!” They shout. This is just one of those provocative slogans that students have composed to let off their angry against the government’s plan to rise the tuition fee of home students and to cut the budget for higher education. Simple and easy, loud and noisy. Students even brought them with loudspeakers to amplify their already burning rage. Just besides the ready-to-erupt volcano made by students, Ed Emery, the PhD student at SOAS was enjoying another type of sound at the corner of a stairway besides the entrance of a modern looked building. “I am 65 years old now.” Ed later told me, on his way leaving the spot where students were standing a few minutes ago. If you are a person that loves to see contradictions, this scene contains so many contradictory factors that may nail your eyesight. Massive students, most of whom are in their 20s and even younger, uses their endless vigor to burst the angry atmosphere as well as the decibel. On the other hand, Ed the 65-year-old person with gray hair and wrinkle, stands alone holding a violin and playing happily. The sound generated by students sometimes overwhelmed that from Ed’s strings, but the old man was far from upset about that. Being a local person from London, Ed is now in his first year of PhD at SOAS, majoring in Arabic and Jewish medieval music. “I support the students. I want to help them to prevent the government from destroying the university.” Ed told me his stance on the education cuts issue and the reason why he chose the very spot. Until then I realized that technically he himself was a student as well. Apart from factors such as his identity as a Londoner and his music-related major, he was actually supporting his own group in a celebrating way. Indeed Ed was standing alone, but he was not lonely. 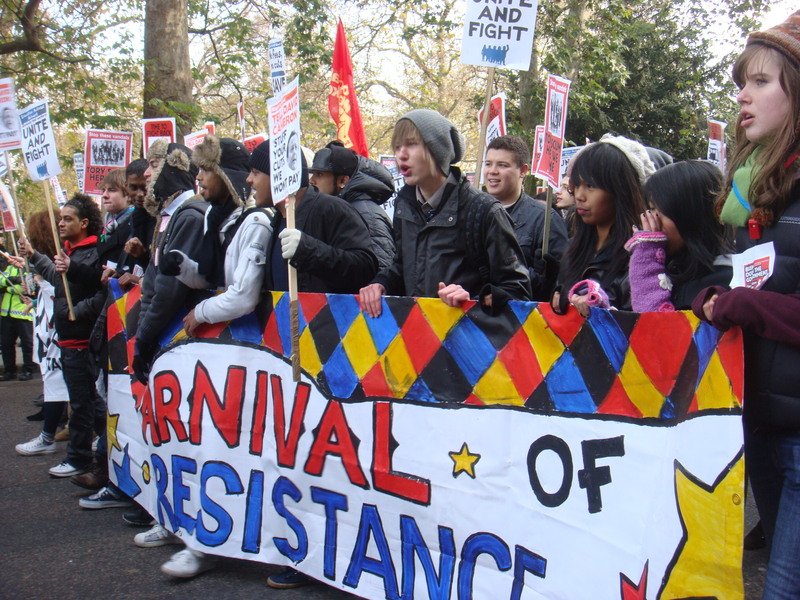 The carnivalesque air was heated up jointly by the students – they were upset due to the cuts but they intended to have some fun as well. If the story ends here, it will be a fair portrait of a big and nice party where everyone is enjoying their moments and delivering the emotions. Yet it may interest journalists less, even it is truly vogue. Except for slogans, the demonstration at the early age resembled the New Year Parade quite a lot, with people dressing up, smiling, playing drums and enjoying the music. It is carnival, it is moving vogue, even only for that specific day. How often can you see Edward Scissorhands on the street? The curly and a bit messy hairstyle, the pale face, the scarlet lips, the neat shirt, and of course, the scissorhands. If you came yesterday, the famous movie character was right besides you. When you are in rage and want to find some place to let your inner steam off, you will always try to find an adversary, and that is also where things always go rogue. The carnivalesque exterior started to fade away when students were blocked by the police at Whitehall, near the parliament building. The tension rose quickly at the confronting line of students and the police, as the police intended to halt the massive student wave yet students wanted to march on. Both verbal and physical contacts were detectable. Students attacked an abandoned police van (and some say it was abandoned deliberately) and tried to swing and turn it down. Later a face-veiled person jumped onto the van, making him the focus of many pictures taken by the media. Two bus shelters in that area was destroyed with glasses smashed. It was difficult for you to ignore the fear from inside for violence when you were just ten metres away from one of the bus shelters. Fireworks and colour smokes were set on by demonstrators, which were only hints that reminded me of the festive stage of this demonstration earlier. With people jumping onto the van, sitting on the top of the two damaged bus shelters, helicopters roaring in the sky and police setting up a cordon, it was really like a battle field. Seeing violence prevailing, I really missed Ed’s serene smiles, and his violin. 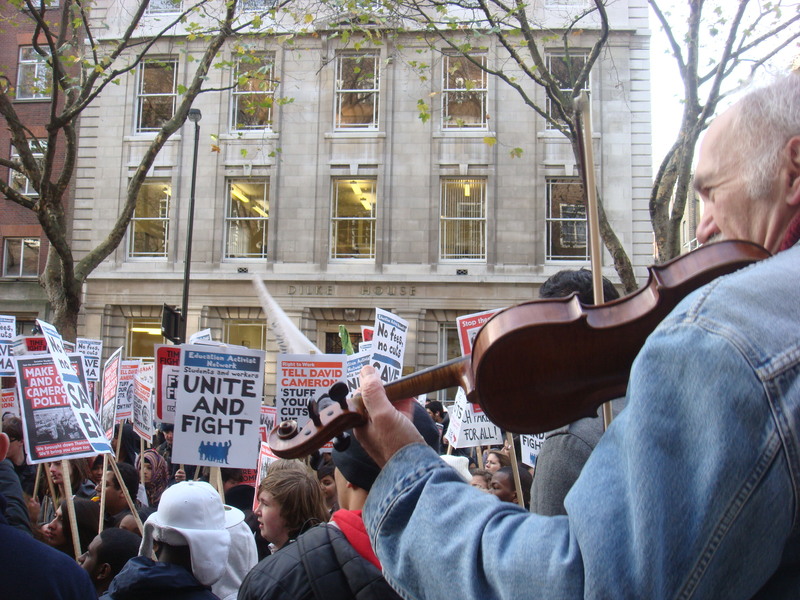 But I am not sure about the true face of this demonstration – the violin or the violence. Or maybe they are just two sides of the same coin. Winter Wonderland in Hyde Park is now ready to please visitors to London from every corner of the world. Let my motion pictures take you to the scene and feel the scream and joy in winter. Hyde Park’s Winter Wonderland is set to cheer visitors from both home and abroad with special Christmas atmosphere. The annual carnival in the famous royal park holds its public preview today from 4 pm to 10 pm, unveiling this year’s 45-day celebration of Christmas and New Year. The Winter Wonderland, which will officially start on 20 November, decides to make Christmas as its main selling point. The organiser tries to deliver an atmosphere of Christmas featured by festive music and ubiquitous figures of Santa Claus and reindeers. A special “Santa Land” has also been set up to prioritize Christmas in people’s minds for the coming winter. Within the “Santa Land” a “Santa’s Grotto” is well prepared to remind people of the warmth in winter with a set scene of home with Christmas tree glitering, and of course, a Father Christmas welcoming. “It is a special memory of Christmas for kids.” She added. The Angel’s Christmas Market is another feature to pay attention for this year’s Winter Wonderland in Hyde Park. A dazzling variety of products are for sale at the market, from crafts to foods. However, sellers seem to be optimistic with detectable caution because of the current economic depression. This year’s Winter Wonderland also includes attractions such as London’s largest open-air ice rink and a 53-metre-tall observation wheel. 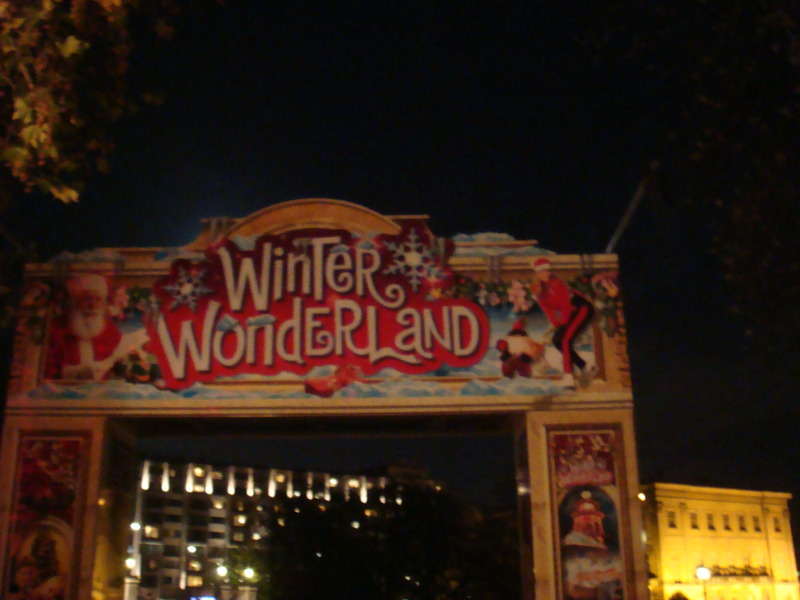 The Winter Wonderland will officially set off tomorrow on 20 November 2010 and blow the closing whistle on 4 January 2011. Unreported World‘s Eamonn Matthews emphasized the importance of truth in TV production during a talk to students on Tuesday. “Our duty is to tell the truth.” He said. 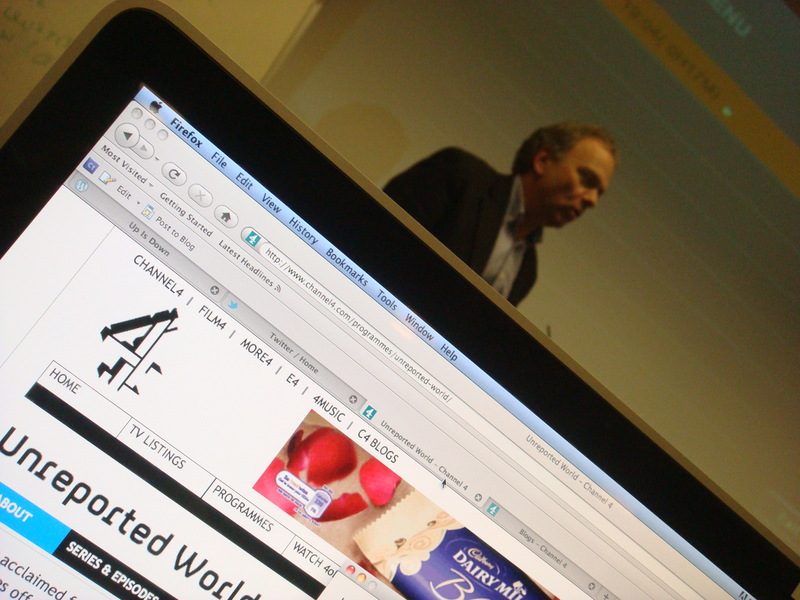 The managing director of Quicksilver Media and producer from Channel 4 gave a lecture to students at the University of Westminster about how to execute good TV journalism. “TV journalism has a duty to put cameras to places that people don’t want you to.” said Eamonn Matthews on the cruciality of transgression in the production of Unreported World. He also pointed out that secret filmming is “important to TV” in the pursuit of the truth, but it must be conducted “in a proper way”. Eamonn Matthews has also acknowledged that truth-telling is likely to sabotage the safety of people who are involved in the prgramme production. There is a possiblity of being taken to the court. In terms of physical safety, he has mentioned that reporters are constantly under threats, among which car crashes and kidnaps are most prominent menaces. Being asked about the possibility of reporters suffering from psychological traumas, Eamonn Matthews told students that “it happens sometimes”. In the respect of the truth, it is sometimes necessary to oppress emotions, as he has also stressed that journalists should not interfere too much into the subject’s life even while reporting stories that may provoke sympathy. “There are real things happening, and only TV can do this job. It can take you to a place and make you feel you are there”. He added. Therefore he thinks that the story is the first thing that shoud be considered before filmming anything. Apart from the story, he has also stressed the character and the narrative as the other two crucial elements for genuine TV journalism. You will need many reasons to see a musical, but you need even more to see it twice. You may like the story, bursting into tears when the Phantom screams “Christine”; you may fancy the music, letting the master composer Andrew Lloyd Webber bring you the sound of Muses. Or it can be really simple, you just love it. Two years ago when I was an exchange student at the University of Nottingham, going to London is a huge project. Only when it was Christmas vacation could it be possible for me to take a first glance at the world’s famous capital (if you count in the curious look that I took up from the plane as the first, then this is the second).It indeed was a huge project as it really needed some intelligence to include the whole London into a 5-day trip. I did not realize that it was a mission impossible until me and my friends were lost in mountains of information. There were just too many to look, too many to experience. But there would still be the trip. Taking an expensive train from the centre of England to London and doing nothing will be noting but being stupid. Finally we made some hard decisions and ticked off some shiny options. But fortunately I persuaded my friends to see The Phantom of the Opera with me. That was a correct decision. It was the the music that made me fall in love with The Phantom of the Opera. First it’s the song Think of Me, which almost grabbed my heart at the first second. The deep passion and the soft voice resonate with me every time I listened to it. Then it’s Angel of Music, All I Ask of You and soon I reached “the point of no return”. By then I was still in the first year of my Undergraduate, allowing myself swallowed by books for the degree. The Phantom of the Opera were also rarely put on stage in China. Therefore to see the musical seemed to be to far for me then. The love became a burden. The dream seemed to be closer when I was qualified to be an exchange student to the UK. So I traveled across the whole continent to the UK. Nottingham was a city that’s good enough for me, at least you had everything you wanted in terms of survival in a foreign country. 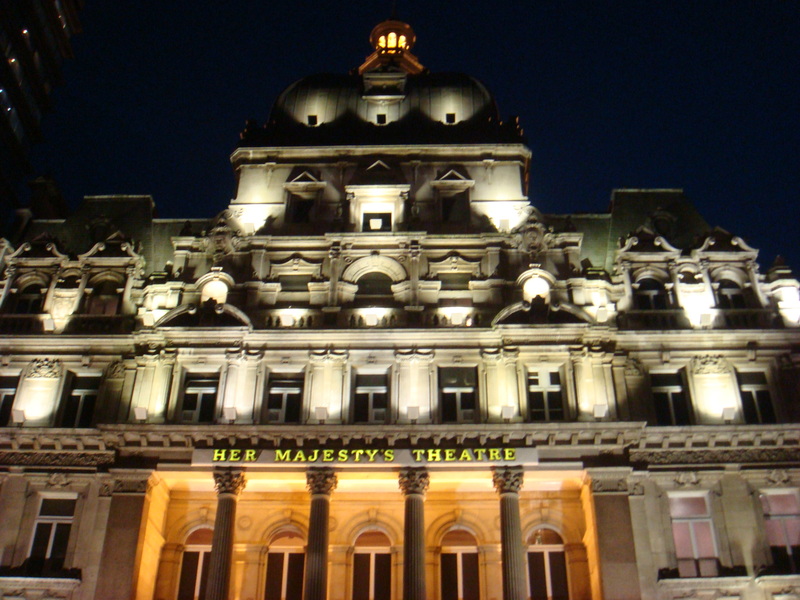 There was also a theatre at the city centre, but sadly The Phantom could hardly come. London seemed to be the only home to him. So the distance remained an obstacle.But at least I could see the figure of him, although through a heavy frost. Finally, finally, I could hear The Phantom calling when Christmas came. That would mean more spare time and a trip to the Capital. It could have been a really banal trip. Hot tourist spots like the tower bridge were visited by thousands of tourists everyday. But not everyone could be so lucky to see a dream musical. 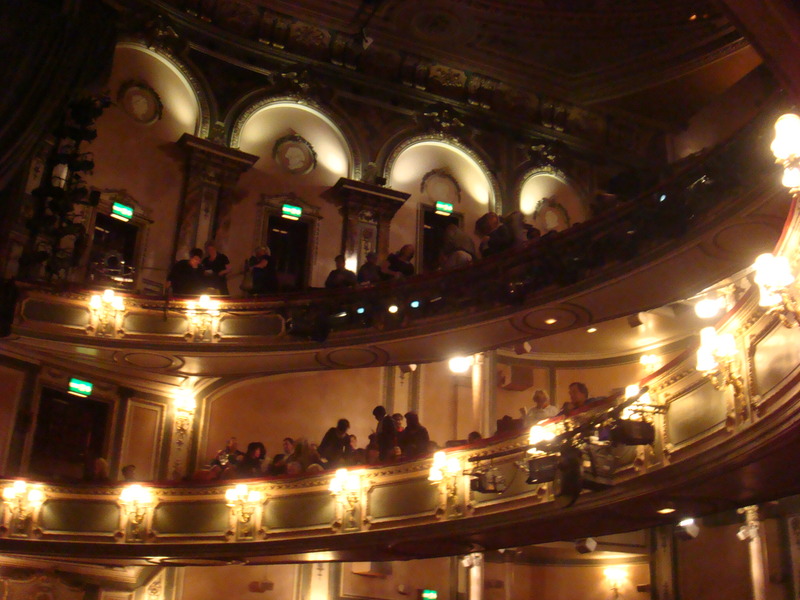 So I decided to make the trip delux by adding The Phantom of the Opera into the list of must-do in London. I could even hardly remember how I walked out of the theatre and took my way back to the hostel after I saw the musical the first time. All that I could recall was that songs were kept playing on and on. We gave a standing over to the actors and actresses. I was amazed by their professional performance. Everything seemed so accurate and natural. I almost cried when I heard Think of Me by my bare ear. My dream finally came true. Two years after that, I am now a journalism student at University of Westminster in London. Now I am AT the Capital. Days are still busy for me as the course pushes me towards a good journalist. Not so many travels to the central London are planned. But one thing was decided even before I visited the UK again. I must see The Phantom of the Opera again. Today it is the 9,999th time that The Phantom of the Opera is performed in London. It is also my 2nd time sitting in Her Majesty’s Theatre. This time I spared my attention to different angles of this musical. Since I’ve participated in dramas in the Undergraduate and once even as a director, I tried to look the stage as a whole. How does the stage set? How do actors spread out when there is a lot of them on the stage? What are other people doing when leading roles are speaking and singing? It turns out to be an interesting observation from a different angle. What’s the same is that I am deeply moved by the story and almost cry when Think of Me is performed by Christine. Will my third attendance take place? I have no idea myself. How many reasons do I need for that to happen? 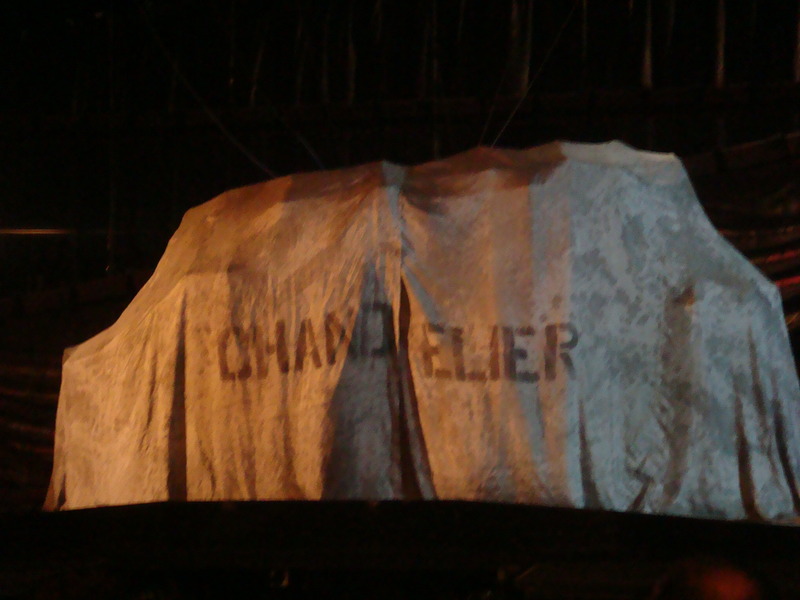 Chandelier covered by cloth. Picture copyright held by the blogger.